When a bishop retires or is transferred, I think about the contributions he made during his episcopal years in that diocese. For Bishop Ed Burns, I am now reminded of his care for his brother priests, particularly his desire to stay in touch by Monday morning phone conferences, his visits to parishes and his emphasis on priests’ gatherings. I applaud all the efforts he made in recognizing the Shrine of St. Therese as a national site for prayer and renewal. 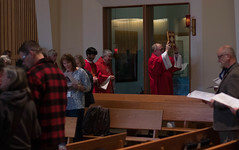 Bishop Burns provided an insightful vision and mission for the Diocese of Juneau in his daily ministry to his people and parishes and in the Synod he called. Last, Bishop Burns was a strong supporter and example for the other bishops of Alaska. We were somewhat separated from the rest of the Church in the United States. Bishop Burns cared for us, taught us and inspired us. 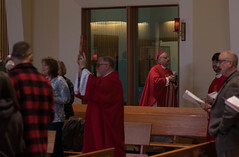 I offer my prayers for Bishop Burns as he begins his new episcopal ministry in the Diocese of Dallas and I continue to pray for and be grateful for the people of the Diocese of Juneau and Alaska.